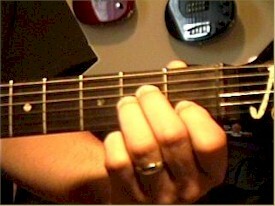 Lyle: In the last lesson I introduced the 5 basic open chords. They where the plain major chords in the open position. 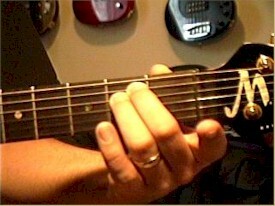 This lesson will show you the three basic minor chords that are in the open position, Am, Dm, and Em, then teach you to use them in a jam progression. david: Are there certain styles or kinds of styles of songs that you shouldn't try to play on an acoustic guitar? Or can it always be 'translated'? Lyle: david, almost any style of music can be played on electric or acoustic. Heavy metal style might not come across very good on acoustic though. 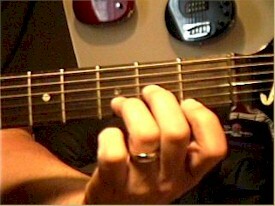 Lyle: For some reason, this chord always sounds bluesy, or like a chord from a Pink Floyd song. Lyle: Let's review the three new minor chords. Lyle: In musical theory terms, the major 3rd degree of the major chord is flatted to a minor 3rd to produce a minor chord. Lyle: This is a good place to take a break. Practice these over and over, then move on to the next lesson!